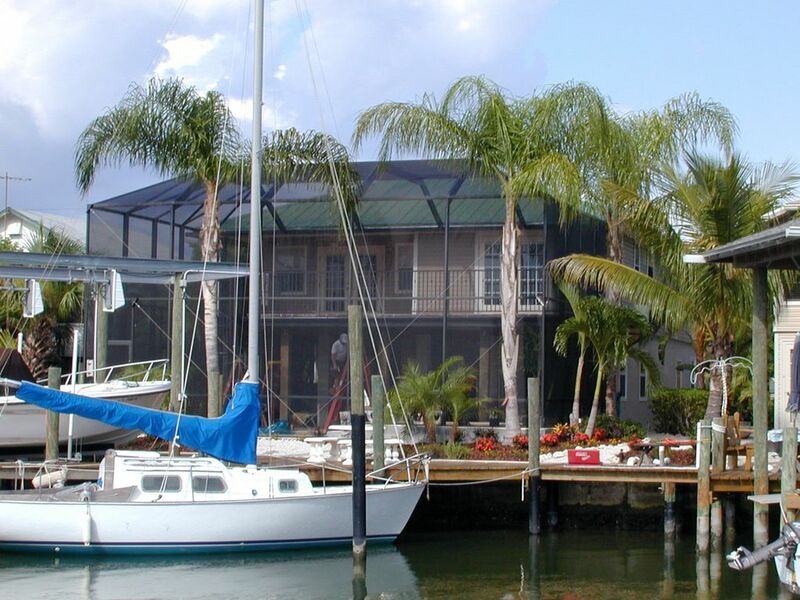 We invite you to experience our newer vacation home, located on the north end of Fort Myers Beach (where all the action is), on a saltwater canal. Enjoy fishing from the dock, walk to the beach (1 block from 7 miles of white sand beaches)or shopping in Times Square. Enjoy the numerous restaurants or dancing without having to worry about driving. Great action for both the kids and adults. All are in close walking distance. An artist from California built the home in 1998. The furnishings/decor is Shabby Chic with antiques, faux finished walls, Mexican tiles, and an out door lanai. Plus a new fully programmed salt water pool/spa added in 2004 includes a closed in cage and an added deck off the upstairs living area for more outdoor private enjoyment and party space. A fully equipped remodeled kitchen in 2013 with lots of seating accommodates any sized occasion or holiday needs. You will feel warm and cozy here. But please, no smokers or spring breakers allowed! If you would like to bring a boat, you can use the dock, at no extra charge. If you enjoy bird-watching/listening, there is an amazing array of birds to view right from the deck. I have seen blue herons, night herons, egrets, pelicans and osprey. Every once in a while you might see a neighborhood otter, dolphin, or manatee in the canal. It is rare that you don’t see a dolphin while taking a walk on the beach. A walk to the tip of Bowditch Point (north point of Fort Myers Beach) and back takes about 1 hr. and 10 min. A walk I like to do once a day for both mind and body. Or just sit and enjoy the sun, warm water, shelling, or whatever your mood? The daily sunsets over the Gulf of Mexico should not be missed. I'm an artist living in the Bay area of California, but have been coming to FL for over 30 years with my family who were snow birds from the Philadelphia area. I built Casa Roxanna in 1998 and have been sharing it with guests ever since. My sister lived next door and when my son was small we used to come for all holidays, but now he is grown so we usually spend the month of November there were we enjoy a traditional Thanksgiving with family and friends. Casa Roxanna is a sweetheart of a house with all the amenities for entertaining. The kitchen is fully equipped and remodeled in Dec. 2013 with lots of counter space for a buffet like party with plenty of seating. When the weather is not too hot, you can open up the 3 sets of French doors, turn off the air conditioner and the inside becomes part of the outside with open deck, more seating and tables, plus you are inside a 2 story cage, so bugs are not a worry. It is very pretty at night to watch the sunset and then the property is illuminated with the lighted pool and landscaped areas. You can bring a boat, fish off of the deck, walk to the beach or Times Square...where all the action is...is minutes away. We love it. Note: a 3 week maximum stay and during high season (Nov. thru April), I rent from Sat. to Sat. During the off season renting mid week is OK. One small dog welcome too. Thank you! The decor is shabby chic with faux finished walls, Mexican tile pavers throughout with bamboo floors in the 3 bedrooms, family antiques and fun art collectibles from all over the world. It is different from the typical Floridian style of furnishings and colors. A homey and comfortable home for a family of 4-6 people or it flows for a party if you have family or friends in the area (only sleeps 6 comfortably though). The location is quiet with easy access to everything. Some guests have been coming for over 10 years. Times Square is a short 5-10 min. walk depending on if you walk the beach or the street. On the way you have many restaurants or shops to visit and many more options once you reach the square. From the Lanai deck area off of the back of the house. Casa Roxanna is located on a deep water canal with an easy 5 min. access to the Gulf of Mexico by boat or simply walk a block to the 7 miles of soft sandy beach. Some and it may vary depending on who leaves what between renters. The kitchen is fully furnished with everything you need for cooking and entertaining. Some condiments and spices also provided. The dining table seats 6 and the bar 7 more. If opening up the outside lanai area, you can seat up to 10 more. The house lends itself to easy entertaining with a large bar for serving. TV's are in the living area and master bedroom. In the pool area under the deck. Deck around the pool and an upstairs lanai. The pool is a programmed salt water system that is easier on your skin and bathing suits and automatically circulates during the day. The hot tub is programmed to reach a maximum 100 degree temperature and depending on outside temps., may take up to 2 hrs. to heat. Please always remember to turn off the heat after usage. Beautiful home, all the little details included! Nice quiet spot on canal to relax but just a short walk to all the action if you want! Would definitely recommend this home to anyone and would love to return! We loved our stay here, this is a nice, fully furnished house on a great canal within walking distance of downtown and the beach. Roxanne is wonderful to work with. The pool and hot tub are great, though I would say the one downside of the home is that there is no solar cover for the pool and we had some cold nights, so the pool was very cold until the late afternoon when it would finally heat up enough to use it. The spiral staircase was also not ideal for our small children, but we kept it blocked off and used the other stairs which are close by so it wasn't a big deal. We loved fishing off the dock and watching the boats go by. Overall a great place, we would definitely stay here again. Great location, close to the action, but still on a quiet street. Was very impressed with this house, it had everything we were looking for, pool, spa, and channel access. This is our 4th rental on FMB, and the best, the house was stocked with lots of extras, both household and beach items, (thank you). The quiet end of the street made for relaxing mornings on the deck, and wonderful evenings in the hot tub. The short walk to Time Square is so convienant, bypassing the traffic is a huge bonus when staying on the island. Would deffinantly recommend this home, and look forward to staying there again. Nice place, very clean. Hot tub and pool great. Location great. Very comfortable beds. Only thing my wife didn't like was the rug in the master bedroom, rough on the feet. Nice of Roxanna to supply beach chairs, coolers, umbrella and beach towels, all the things that are hard to take with you when traveling through the air. Well supplied kitchen. Love the fact that it is encouraged to leave anything next family can use: ex. spices, condiments or unopen snacks, soda's and beers. When operating pool and hot tub from inside, follow the directions at stated, but there is about a 15 second delay after you push a button so wait before you push another. I would definitely stay there again. This house is in the perfect location for enjoying Ft. Myers Beach. Most of the entertainment (Beach, shops, bars, and restaurants) are within walking distance. But it sits off the main drag at the end of a side street so it's very quiet. If you want to go somewhere that's not within walking distance, the trolley stop is at the end of the street and very convenient. The house is stocked with everything you could need for a day at the beach. There's no need to bring anything. We really enjoyed our stay and would definitely stay there again. I am so glad you enjoyed Casa Roxanna as much as we do, it means a lot to us. Thank you for your nice review. The house is very nice and it was very well stocked. It is just a short distance from the beach. About Fort Myers Beach: Fun for the Whole Family! Fort Myers Beach, Florida, located on Estero Island, has been dubbed the “best beach in the world,” because of soft currents, shallow water, and gently sloping terrain (gentle surf is great for small children). Much like Myrtle Beach, South Carolina, Fort Myers Beach is filled with tee-shirt shops, restaurants, and gift boutiques. Outdoor activities, like water skiing, parasailing, boating, fishing, golf, and seven miles of beautiful beaches, the main attraction. Fort Myers Beach is also near other great vacation possibilities. miles into Fort Myers and see the Fort Myers Historical Museum. Whatever your taste, Fort Myers Beach is a perfect vacation spot for the whole family. Myers was named honor of Colonial Abraham C. Meyers, the son-in-law of the commander of Fort Brooke in Tampa. Located in beautiful Lee County, Fort Myers has activities to whet any taste bud. shore fisherman. Golf courses are also in abundant supply. Digest as one of the best public couples in the United States. bulb, but did you know he invented wax paper and tin foil? Ford bought the property adjacent to Edison, and the two magnate’s families wintered together in Fort Myers. Ford’s estate, “Mangoes”, is separated from Edison’s by a “Friendship Gate”,which came to symbolize the close bond between the two tycoons. They entertained luminaries such as Charles Lindbergh, Harvey Firestone, naturalist John Burroughs, Nobel Laureate Alexis Carrel among others. includes a recovered P-39 Airacobra fighter plane. and Sanibel Island, and its pristine white beaches, is barely twenty. vacation rental dates at Casa Roxanna (Gulf Coast, Fort Myers Beach, Florida USA). Rentals are weekly, Sat. to Sat. Rental details will be given when you inquire. Please include full details – your name, phone numbers, an accurate email address, and your guests ages. Casa Roxanna does not rent to spring breakers. Thank you!